Visitors are urging museums to take a stand on social issues--what can cultural institutions learn from their corporate counterparts? Nelson Rockefeller, far right, at the establishing of MOMA’s film library, 1935. Courtesy of MOMA archives. Traditionally, the relationship between a company and a museum has revolved around philanthropy–namely, the financial and institutional support of wealthy patrons from the business sector. Take the Rockefeller family’s relationship with the Museum of Modern Art: in 1959, Mrs. John D. Rockefeller became president of the MoMA’s board, followed, in 1987, by her son David, president of Chase National Bank. The Rockefellers supported MoMA financially, but they also encouraged other corporations to support cultural institutions around the country. 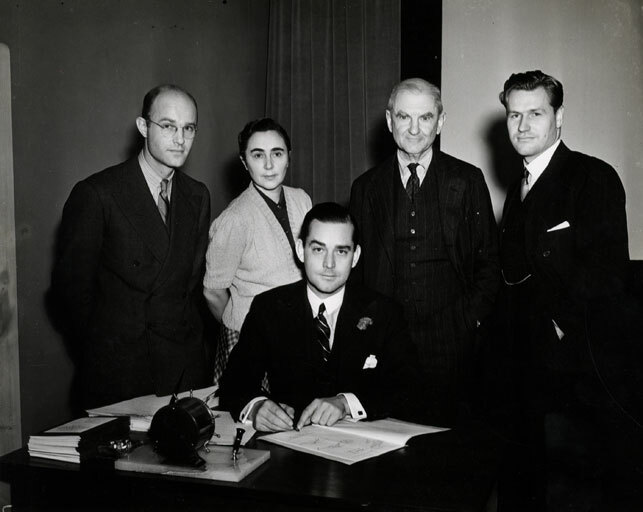 David Rockefeller eventually went on to form the JP Morgan Chase corporate art collection and pave the way for the National Endowment for the Arts through Rockefeller Brothers Fund panel reports on the importance of federal funding for the arts. While the Rockefeller family was linked to questionable business practices – John D. Rockefeller, founder of Standard Oil, was criticized for his ruthlessness and unethical approach in building his company–MOMA and other Rockefeller-backed cultural institutions did not face the same criticism as other museums have in recent years. More recently, protestors have started questioning museums’ relationships with large corporations. Take, for example, the Sackler family, who fund several museums around the United States. The Sacklers own Purdue Pharma, the company that developed OxyContin and is largely blamed for the growing opioid crisis in America. The artist Nan Goldin, who has spoken publicly about her own struggles with OxyContin addiction, has launched P.A.I.N. (Prescription Addiction Intervention Now), whose mission statement is “to [make] the Sacklers and Purdue Pharma responsible for helping to find the solution to ending America’s opioid epidemic.” P.A.I.N. has organized protests at Sackler-funded museums, art spaces, and educational facilities, including the Metropolitan Museum of Art, DC’s Sackler Gallery, and Harvard University’s Sackler Museum, encouraging them to refuse donations from the Sacklers and Purdue. Nan Goldin (center) leads a P.A.I.N. 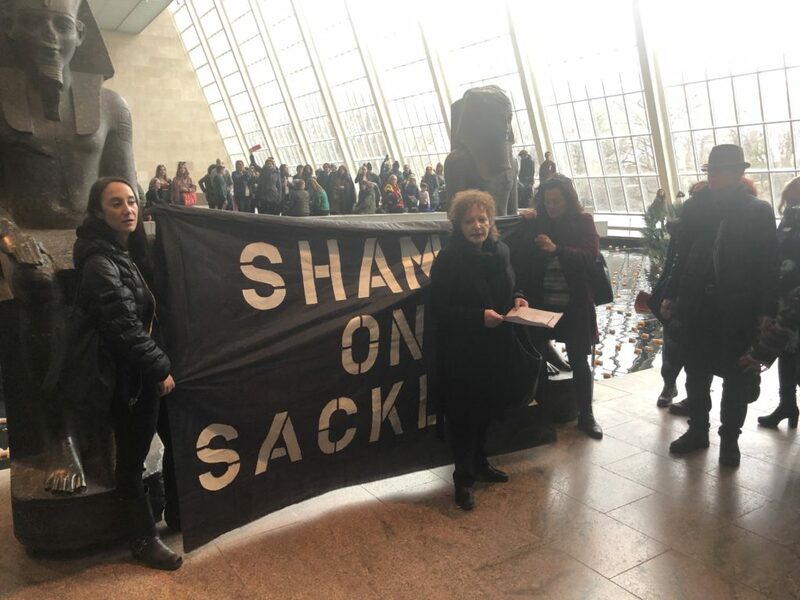 protest in the Metropolitan Museum of Art’s Sackler wing. Photo courtesy of Andrew Russeth via ArtNews. P.A.I.N. is just one example of protest groups targeting cultural institutions. These present-day organized protests are indicative of a recent cultural shift in societal expectations of museums. Culture Track ‘17 found that “the future of cultural philanthropy will be interest-tailored and impact-driven, with greater emphasis on ‘SROI’—Social Return on Investment,” with the top reasons for donating to culture centering on social impact. If visitors and donors care more about social impact than ever before, it will become increasingly difficult for cultural institutions to remain neutral when it comes to where their funding comes from, or where they stand on broader social issues. As museums face increasing scrutiny for their social impact, they may choose to take lessons from corporations that have implemented strategies for corporate social responsibility (CSR). Companies can be more than patrons of the arts; they can serve as examples for institutional strategy. Of course, museums are not Fortune 500 companies; they have different business models, value propositions, and everyday challenges. However, as it becomes clearer that consumers want museums held accountable for their larger impact, it has also become evident that museums and cultural institutions stand to benefit from implementing CSR strategies. 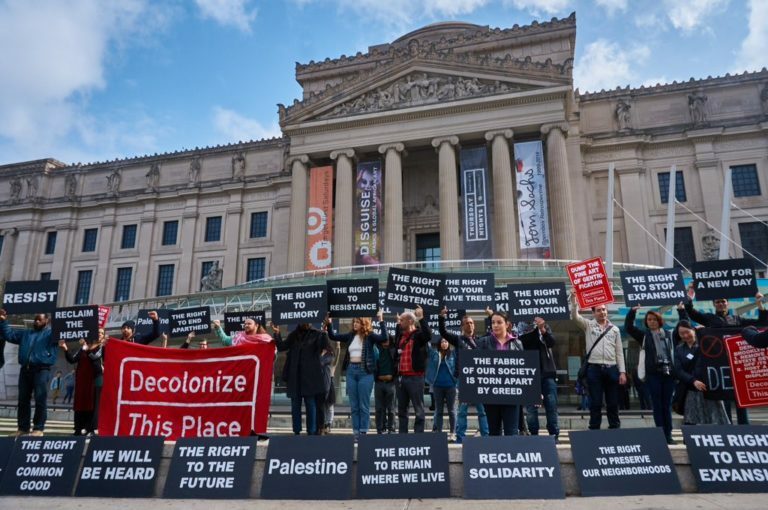 These can center on social-justice-oriented exhibitions and programming–take, for example, the Brooklyn Museum’s “Soul of a Nation” and the Whitney’s “An Incomplete History of Protest”–or extend into internal policy benefitting museums’ employees and community. In engaging in social issues, museums will not only satisfy politically-minded donors and visitors, but they will also attract a more loyal, motivated workforce that is, in turn, better equipped to address important future social issues. 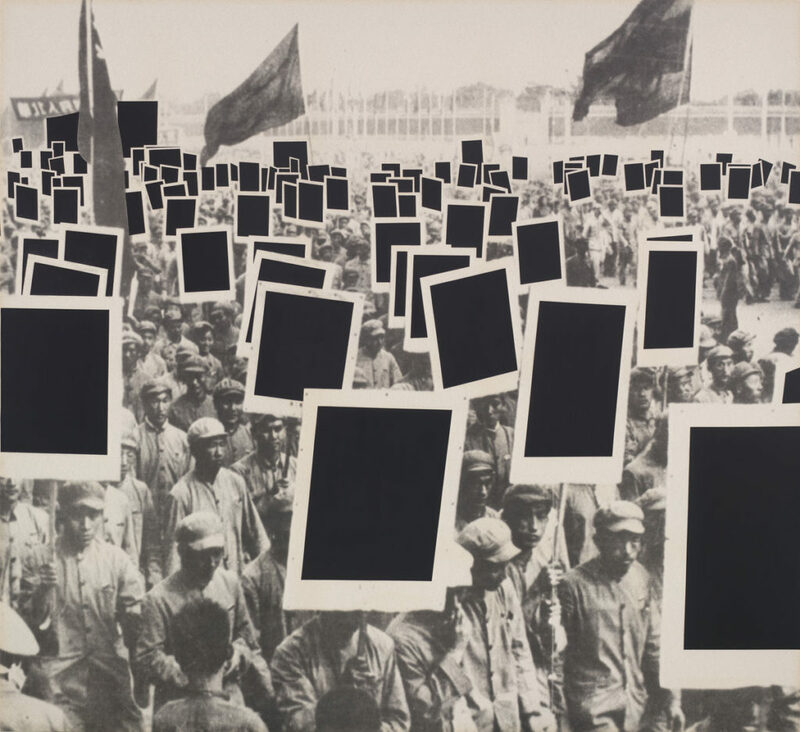 “Black Mass” by Annette Lemieux, one of the works featured in the Whitney’s “An Incomplete History of Protest.” Courtesy of Annette Lemieux, via Whitney Museum of American Art. The key factors cited for the present “intense focus” on corporate citizenship are consistent with findings from Culture Track ‘17: we are living in an increasingly transparent world, where internal and external behavior is impossible to hide. In addition, companies must work to meet the expectations of millennials, the largest age demographic in the workforce. The Deloitte study found that 88% of millennials believe that their employers should play a role in “alleviating societal concerns,” and 86% think businesses should be held accountable for more than profitability. Present-day organized protests are indicative of a recent cultural shift in societal expectations of museums. A strong corporate citizenship strategy serves two purposes: it helps a company attract and retain valuable employees, and in our current socio-political landscape, it serves as a marketing tool that mirrors the expectations of younger consumers. The employees and consumers that those companies appeal to are, in many cases, the same audiences that museums are targeting. Museums have the potential to benefit immensely by taking action when it comes to social issues that are important to their audiences. Internally, they would attract a more motivated, valuable, diverse workforce that would be less likely to job hop and more likely to contribute to a positive internal culture and reputation. Externally, museums would attract more visitors and donors by appealing to their inclination to consume and support culture at an organization that is having an impact. Protestors outside the Brooklyn Museum. Courtesy of @kino___eye via HyperAllergic. Millennials are not the only generation that cares about corporate citizenship: a 2017 Cone Communications study found that 78% of Americans want companies to address important social justice issues and 87% will purchase a product because a company advocated for an issue they cared about. The generation behind millennials, Gen Z, is notably active when it comes to social justice. According to research from FutureCast and Barkley, Gen Z “will force brands to take a stand on the issues that matter. For this generation, silence is not golden and they will hold their favorite brands to the same standards they set for themselves.” Nike’s recent controversial Colin Kaepernick ad is a prime example of this shift – after an initial backlash, Nike stock is at an all time high and a Canaccord Genuity survey showed that the majority of consumers support the ad. The question of to what extent museums and cultural institutions should be socially responsible is an open one, and the answer will be different for every organization. Art is an excellent vehicle for social change–it sparks empathy, helps us solve problems creatively, brings people together, builds cultural bridges–but how does a museum choose which social issues to take a stand on? Where do museums draw the line between academic study, transformative individual experience, and social responsibility to their communities? Beyond these broader philosophical questions, there are other barriers to consider. Perhaps the biggest challenge to implementing corporate citizenship is the lack of diversity at the leadership level for most museums. Many museum board members come from the corporate sector, so it would make sense for them to draw on their professional experience when it comes to weighing in on institutional strategy as it relates to CSR. But because museum boards tend to skew older – 83% of nonprofit board members are older than 40 and 67% are older than 50 (Leading with Intent, 2017) – many members are either at the end of their careers or retired, and might not be aware of the importance of citizenship and social impact in the current landscape, corporate or otherwise. Bringing younger perspectives from the corporate sector onto the board could potentially help drive some of these conversations. 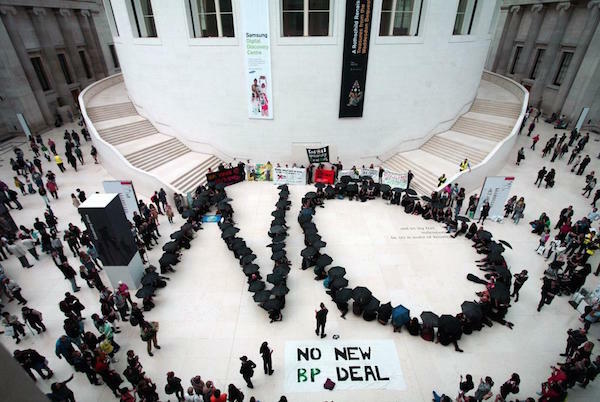 Anti-oil protesters at the British Museum, 2015. Courtesy of Niklas Halle’n and AFP, via Artnews. Even if an institution does have a board and leadership team that is supportive of social impact efforts and is reflective of the community it is serving, there are logistical and operational challenges that museums looking to engage socially must face. Ultimately, a nonprofit cannot be compared with a for-profit company like Google or Starbucks, especially from a resources and financial perspective. There might not be budget to hire for and invest in social impact efforts; and rewiring current resources to address some of these issues could prove challenging if an institution has always taken a traditional neutral approach. What makes demonstrations like Nan Goldin’s P.A.I.N. protests so interesting is that they are linked to an unprecedented demand for change that, if met, could lead to an actual return on investment for museums. The values of younger generations will push museums to take a stand on issues that are meaningful to their visitors and communities, and much can be learned from the evolving landscape of corporate social responsibility – especially the recent shift toward active corporate citizenship. It seems inevitable that museums will only have an increased social responsibility to their communities, and as such, they could benefit immensely from implementing CSR strategies. A strong CSR strategy would drive internal change by attracting valuable and diverse employees and donors, which would manifest external change: programming and exhibitions that reflect the increasingly diverse communities museums serve, which in turn will fuel the donor pipeline. A neutral approach has led to protests; driving conversations with an authentic approach will lead to engagement. And in 2018, museums that truly engage audiences in ways that are consistent with their values will thrive.